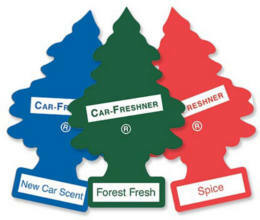 What's your favorite air freshener? The Tundra I just bought had a couple blue trees tucked inside. It’s quite the musk, and certainly an acquired taste; however, it’s not my style. Back in HS, I used to get the Drakar Nior scented bag from Pep Boys to go under the seat in my 929. Loved that one! Unfortunately, I can’t find it anymore, and I think the Drakar scent disappeared along with my use of axe body spray. Perks of getting old. But now I’m left with my new to me pickup and wanting a new smell. Febreeze and go? Activated charcoal in the carpet? What’s your scent?